M.A.S.K! Illusion is the ultimate weapon! For those that think that the Mask collection is based on that abysmal cartoon that is also based on the Jim Carey, then you are very fortunate my dear readers, for this incarnation not only predates that movie but is totally different than a guy or dog putting on an ancient mask of Loki. The M.A.S.K. (Mobile Armored Strike Kommand) team is secret organisation that is led by Matt Trakker who endeavours to fight the criminal world when they police and military have failed. Trakker’s team are empowered by special masks that give them access to a variety of powers in order to fight their rival organisation VENOM, who get up to a plethora of nefarious activities in attempt to destroy the free world. Fortunately for our team at M.A.S.K, they also have access to a wide variety of equipment and vehicles in order to keep the status quo and prevent VENOM from ruling the world. This was definitely the big draw card when this series was originally aired on television during the 1980’s. Each episode starts with Trakker using his “super” computer to select certain agents who are best suited to the task at hand with the storylines portraying that classic “80’s” excitement without anyone really getting hurt. 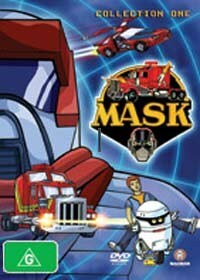 Clichéd storylines, over the top acting and that classic animation where computers could do anything in the future, M.A.S.K. is definitely recommend for those wanting a trip down memory lane or for those with younger children who wish them to watch good clean entertainment. Highly Recommended!